During August and September this year I was fortunate to be awarded Photo Of The Day on the Australian Digital Photo Of The Day website. My image that was recognised in August, titled 'Devoted', is a candid photograph I took at the well known Melbourne intersection of Flinders and Swanston Streets. In capturing the 'Devoted' shot I had to move very quickly and step off the pavement into the gutter to gain a clear view through the viewfinder as there were numerous people around me. Keeping a keen eye out for something a little different and getting it in the camera that day was a definite challenge, however it was most enjoyable. 'Devoted' is an image that personifies life and dedication. A candid shot I took earlier this year was awarded a Photo Of The Day in September. 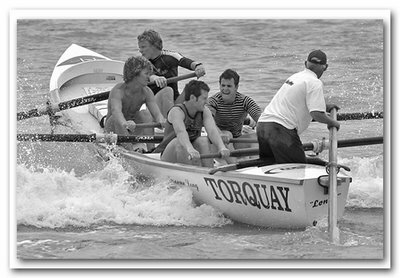 The image titled 'Torquay Lifesavers' was taken on the main beach in the Victorian seaside town of Torquay. These 'Torquay Lifesavers' were out on a very gloomy Saturday morning going through various training exercises and I couldn't resist the opportunity to take this shot as I could see the word 'Torquay' on the back end of the boat. Candid photography is a genre that presents many challenges to a photographer and it's unfortunate that some people in society have become a little suspicious of the camera. The context in which images are used is a responsibilty that most photojournalists comprehend and it's one I most certainly respect. I believe the recording of people going about their everyday lives is an important record of our society and long may it continue. It's a style of photography I feel very comfortable with. You may access my gallery of images on the Australian Digital Photo Of The Day website by clicking here. Olivia Newton-John performs 'Hopelessly devoted to you'. Great piece Darren, and Congratulations on your sucesses with POTD, they are well deserved. These are fine examples of your skill and dedication to photography and your journey. Well done Darren. Thanks very much for your kind comments - much appreciated. Must say you've also enjoyed success on the ADPOTD website and congratulations for your achievements. Sam, I feel it's vital to capture images of people because it records what life is all about. 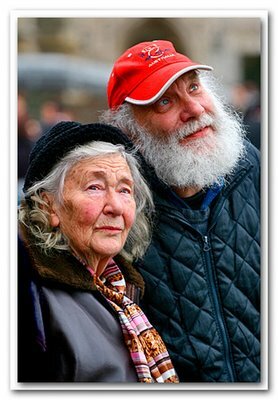 We need to keep that in mind as it's the images of people that we generally end up cherishing the most.